The cost of the new International Arrivals Facility at Sea-Tac airport has swelled by another $40 million to $830 million, and the project is running five months late. 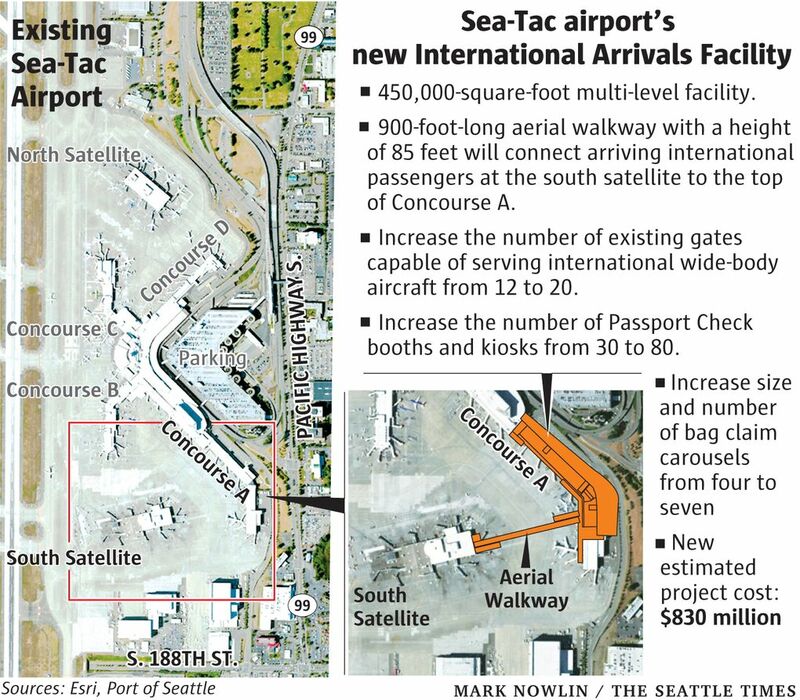 The expected cost of the new International Arrivals Facility at Seattle-Tacoma International Airport has swelled since last August by a further $40 million and now stands at $830 million, or 21 percent higher than originally estimated, according to a memo prepared by the Port of Seattle. In addition, officials announced at a Port Commissioners meeting this past week that the project is running five months late and is now not expected to open until February 2020. The original adjusted estimate of the project’s cost was $684 million. According to a list of the added costs in the Port’s memo, the largest budget-busting items — $86 million out of the total $146 million overrun — were attributed to contractor Clark Construction initially underestimating its design costs, failing to design to the adjusted budget and misjudging airport building-code requirements. Ralph Graves, the Port’s senior director for Capital Development, told the commissioners that Clark consistently fell short in performance reviews for more than two years. David Brush, the Port’s IAF program leader, told Bowman that “we did raise holy hell with the senior managers” at Clark. Clark representatives did not attend the meeting and could not be reached for comment late Tuesday. When Port officials presented a memo on the cost increase and delay at the meeting this past week, Commissioners Peter Steinbrueck and Stephanie Bowman expressed their concern. And Bowman called out last year’s commission president, Tom Albro — “our point person on the IAF” — for lack of oversight. Albro is no longer on the commission. 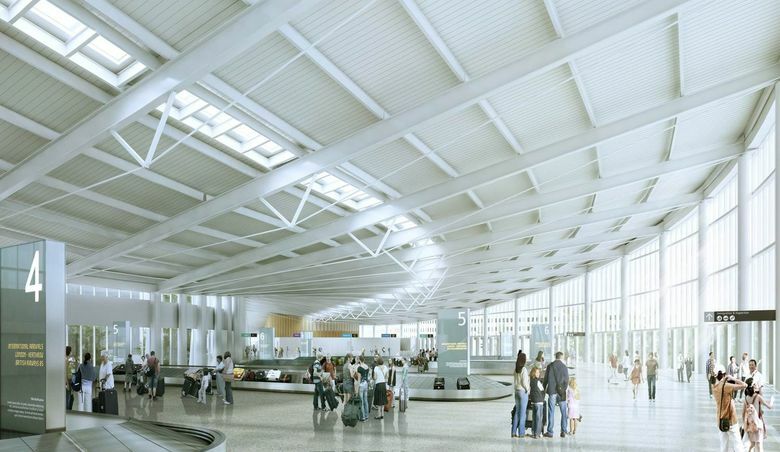 The new International Arrivals Facility (IAF) — a 450,000-square-foot add-on to the current Concourse A in the main terminal building — will double peak international arrival capacity to 2,600 passengers per hour, according to the Port. Arriving international passengers will walk along a new 900-foot-long aerial walkway, 85 feet above the existing airplane taxiway, from the south satellite over the top of Concourse A to the IAF. About 75 percent of the cost of the IAF will come from federal fees that are tacked onto every passenger’s ticket at all U.S. airports — currently $4.50 per passenger for each leg of a flight up to a maximum of $18, plus an extra $6.15 for international passengers at Sea-Tac. The remainder of the IAF budget is covered by the Port using funds such as fees levied from the parking garage, airport concessions and taxis, Port spokesman Perry Cooper said. In 2015, the original estimated cost of the IAF was just $608 million, though later some additions to the plan later bumped it up to $684 million. In January 2016, the Port authorized Clark Construction to begin design work. By mid-2017, according to the staff memo, Clark’s design had exceeded the target budget by approximately $100 million. And that August, when construction commenced, hazardous polychlorinated biphenyls (PCBs) were discovered on the construction site that required $4 million in remediation and caused three months of delay. The increased cost of building materials and labor in the frenzied Seattle construction market also added some $14 million to the project’s cost. Finally, in late 2017, when the design was nearing completion, certain project specifications were changed late in the process, which caused additional costs and further delay. A final “guaranteed maximum price” still has not been determined, the staff memo states, while forecasting the new ceiling of $830 million. The budget hike and delay was first reported Tuesday by the Puget Sound Business Journal. Information in this article, originally published April 3, 2018, was corrected April 5. Due to incorrect information from the Port of Seattle, a previous version of this story misstated the total federal fees applied to passenger tickets at Sea-Tac airport and the proportion of IAF funding that comes from those fees.